The Robe Shop is your official Oak Hall representative for Custom Academic regalia in your school hood colors, Oak Hill academic regalia, doctoral regalia, faculty robes. Buy Masters gown, bachelor gown, velvet tam. Order your custom PhD regalia, academic hood, doctoral hood, doctoral tam, doctor hood. Masters regalia, custom doctoral regalia, faculty regalia, woman owned small business. Why choose The Robe Shop for Tailored Academic Regalia? No sales tax for most customers! GRAD SEASON surcharges begin MAR 1- Order now to SAVE MONEY and BEAT THE RUSH! Don't delay- we need at least 6 weeks (8 weeks in grad season) prior to your ceremony to offer the best price! Call us today and we'll help you with the order process. See Regalia 101 for all the facts, tips, and measuring help. If you are looking for one-time use or rental regalia, souvenir caps & gowns, please see our Graduation division, Grad Goods & More. President Doctoral Gown Price range from $703-842. 3 month lead time required. A prestigious robe for the college president or head administrator. Choose a matching velvet tam with metallic tassel and a hood with corded piping outlining the velvet to complete this distinguished regalia. It is traditional for the president to wear the colors of the school where he/she presides, rather than the school conferring the original degree earned. The academic code does not bind the college president to any particular colors, and all are entitled to a doctoral hood, whether or not a doctorate was earned. 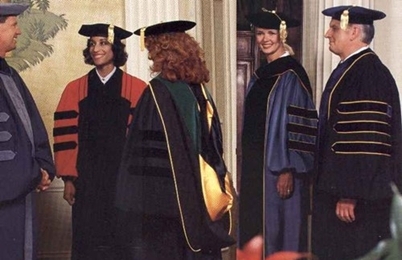 A president gown always has 4 sleeve bars. A velvet hem band is an option with certain limitations, please inquire. Choice of 7 fabrics in an assortment of colors. Velvet can be chosen from any appropriate academic color. Corded piping is included in the price and an integral part of the design. Choose from the bright gold color shown, or any appropriate color. Marshall Doctoral Gown Price range from $661-810. 3 month lead time required.A prestigious robe for the academic leader, differing from the President only in the chevrons- the Marshall has the traditional 3 chevrons on each sleeve. Velvet hem band can be an option, with certain limitations- please inquire. Want to pick fabrics? Not if you are ordering Special Regalia. Your school already picked FOR you, and contracted us to reproduce their choices EXACTLY. Special Regalia Prices vary by design. Some prestigious schools have designed a special costume, often using a special color fabric, additional insignia, trims, etc. We have a list of schools which have designed a special regalia in association with our company (see the list) -many with photos available by request. Ordering special regalia is very easy as all the choices have been made by your school. Our printed catalog is of little use since only a few schools are shown there. Use the order form below and provide us with your measurements! Contact The Robe Shop as We represent Oak Hall- all our Special Regalia are made by Oak Hall. Kente Doctoral Gown Price range from $550-605. 3 month lead time required.Corded piping accent: add $71.00. Jefferson Doctoral Gown Price range from $500-639. Corded piping accent: add $71. Madison Doctoral Gown: Academic tailoring at its very best! Price range from $628-742. Corded piping accent: add $71. Doctoral, Specialist, Master's, and Bachelor's Hoods Price range from $113-$196. Optional corded piping hood accent for any degree level: add $41. Carryall Bag Email Order -Please provide your mailing address! Item #GNH-114 $398.90 The John Wesley Black Doctoral Robe for Men. This robe is ALREADY MADE and meets academic standards for a doctoral degree, suitable for taking part in a convocation or other collegiate setting. Yes you can rent or purchase an academic doctoral hood and/or tam to match. Just ask! NEW! Item #GNH-115 $398.90 The John Wesley Black Doctoral Robe for Women. This robe is ALREADY MADE and meets academic standards for a doctoral degree, suitable for taking part in a convocation or other collegiate setting. Yes you can rent or purchase an academic doctoral hood and/or tam to match. Just ask! Ready-made sizes for men only. Please provide measurements. The style names of these Doctoral robes have no academic significance and are just a designation for style types offered by our suppliers. All prices are in U.S funds, and do not include shipping charges. Our order form linked by each product provides shipping details. See Regalia 101 for all the facts, tips, fabric descriptions and measuring help.